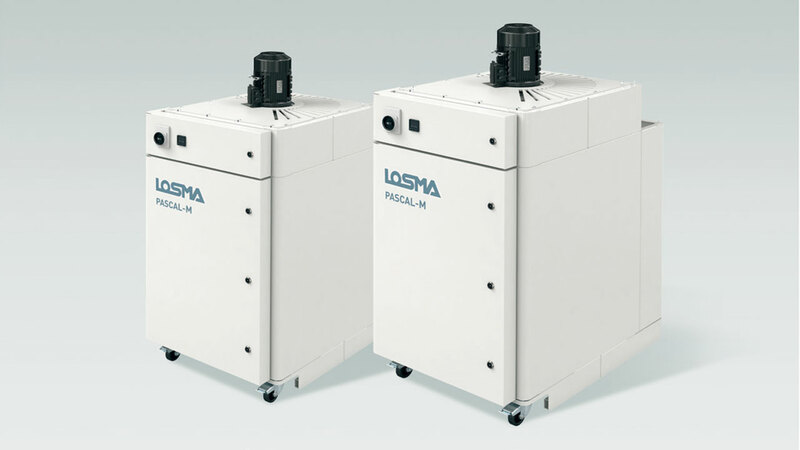 The new Pascal M filter series are designed for the filtration of dusts and smokes deriving from many machining processes. It is mounted on a wheels allowing easy movement. Access to filtering section is very easy and quick. You can just open the front door to access the filters, which can easily be extracted and replaced in a short time. The filtration module has specially been conceived for the industrial sector, where important features lie in its sturdiness, reliability and easiness of conduction and maintenance. It is available in 2 sizes with flowrates of 1.500 and 2.500 mc/h with increasing filtration rates to reach 99,97%. The air entry section, which connects the piping or the suction arm (optional), consist in a large section which serves as a calming chamber (A). These cartridge are kept in perfect conditions from a cleaning system (optional) using compressed air (C), consisting in a Timer which manage the opening of the electro-valves positioned on the storage reservoir and the cleaning cycles. The horizontal positioning of the cartridges allows fast and quick maintenance, access to the filtration chamber is possible through a hinged door. 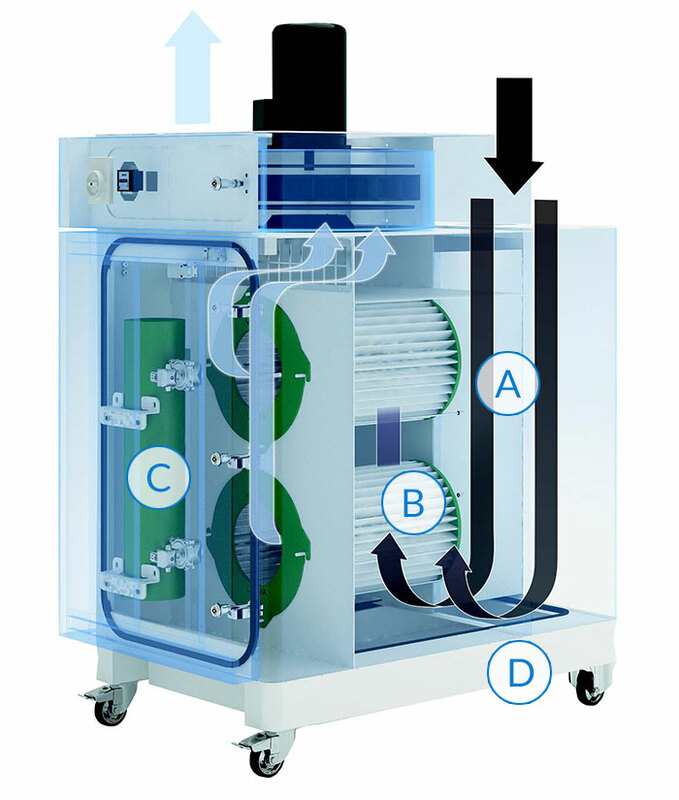 Filter removal is easy, quick and clean, because the dirty chamber is separated from the clean section by a panel which also serves as a support structure for the filter elements. 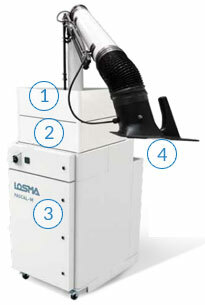 Dust is collected in a collection tank (D), which can easily be removed and emptied. The filtration group is equipped with a trolley in order to be moved into workshop. Cleaning system in counter-washing composed by a programmable Timer, collecting tank and electro-valves. 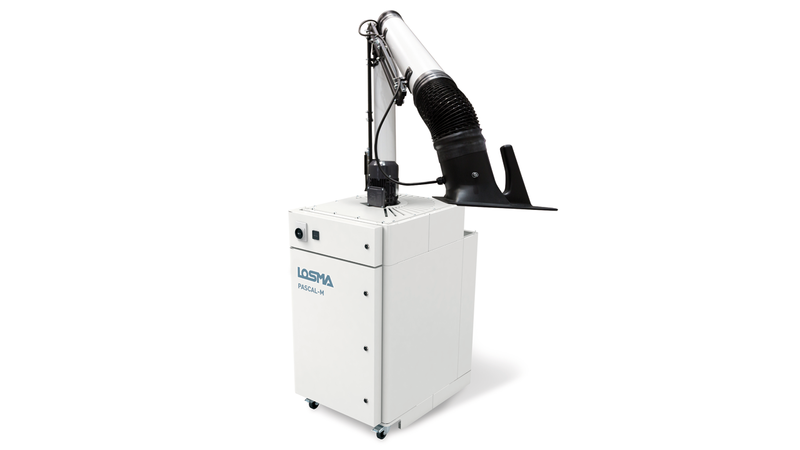 Suction arm with 3 joints, including a 360° turning swivel ring and cupboard with handle.